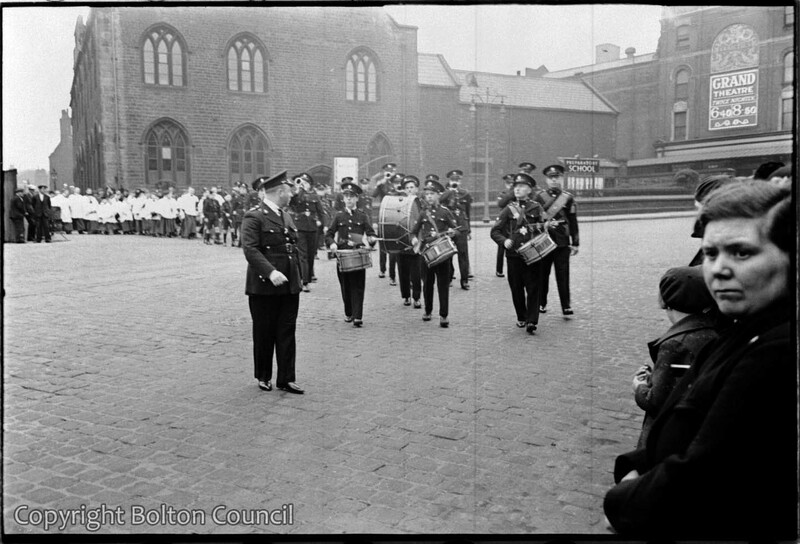 A church procession enters the Churchgate area (bottom of Silverwell Street) in front of the Grand Theatre and Bolton Church of England Educational Institute: Preparatory School for Girls. This and the next 5 photographs appear to be the Church Lads Brigade (Bugles,Drums and Company), Choir, Church Wardens (with staves), Verger, Vicar (or Lecturer) of Bolton, Sunday School Singers (all in white … dresses, veils and shawls), Sunday School and Congregation (Mother’s Union, etc.) of The Parish Church of St. Peter, Bolton le Moors. I remember Sermons Sundays, in the 50’s and 60’s, forming up in Silverwell Street, crossing Churchgate, in front of the Church gates (to the left of this view) and into Church Bank to process around the Bury New Road, Castle Street, Dorset Street area of the Parish, before returning to Church for a Service. The buildings, in the background are the Parish Church Sunday School and the Paley Street ‘side’ of the Grand Theatre. The front was on Churchgate. I’m not sure the sign says ‘Preparatory School for Girls’ I don’t remember it being mentioned. ‘Bolton Church of England Educational Institute’ doesn’t ring any bells, either. There was The Church Institute …. in Institute Street. That became Canon Slade Grammar School, when it moved to Bradshaw Brow. The old building was last used by Reebok, I believe. I do know that behind the two large windows, on the groundfloor, were six (?) full sized snooker tables. The first floor was taken up by a large hall. The lace curtained window and black door, behind the ‘school’ sign was the Verger’s house. Newspaper House, The Bolton News offices now stand on the Sunday School site. The Grand, together with the Derby Arms and the Theatre Royal were demolished c.1965 to make way for Churchgate House and Lennon’s Supermarket. The school was Church Institute.My mother went there.It wasn’t a girl’s’ school. Do you remember a killing at a house opposite the church in the 60s? Two children,a boy and girl, killed their abusive father. They attended our school and we were warned not to discuss it.